In 2004, as part of the reconstruction of the Harlem River Drive, the NYC Department of Transportation proposed a "Flyover" or "Entrance Ramp Structure" to be attached to a reconstructed 127th Street viaduct/overpass on the Harlem River Drive. The plan proposed widening the Harlem River Drive, reconstructing the existing 127th Street Viaduct and constructing an elevated structure, the Flyover, from 126th to 131st streets. The total cost of the project was estimated at $78 million. Increased exposure to vehicular emissions for many residents living near the 3rd Avenue Bridge and the Harlem River Drive between 126th and 131st streets - a community already suffering from one of the highest asthma rates in the nation. Increased vehicular noise in the area, which would likely be accentuated by the echo effect off the Harlem River. The loss of 12 feet of land dedicated to Phase III of Harlem River Park, due to the widening of the Northbound lanes of Harlem River Drive to make room for the Flyover structure. The Flyover structure would put, formerly known as, Phase III of Harlem River Park (the future Southern Phase) in permanent shadow during the afternoon, its peak usage period. The Flyover would create a permanent visual barrier, blocking views of the waterfront, reducing real estate value of the surrounding area, and further separating El Barrio/East Harlem from its waterfront. A digitally constructed image of the proposed Flyover over Harlem River Drive. Looking south from the 3rd Avenue Bridge at the proposed Flyover. From 2004 to 2005, the HRPTF and its members submitted letters of concern and petitions to NYC Department of Transportation and the NYC Transportation Coordinating Committee, which operates under NY Metropolitan Transportation Council, urging them to discontinue the Flyover plan and propose a less harmful alternative. 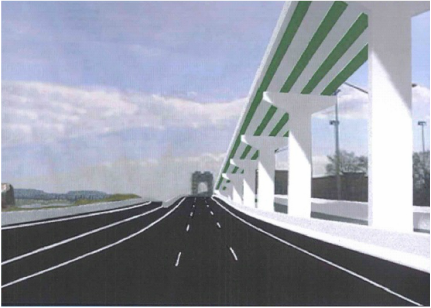 A compromise was finally reached when the NYC Department of Transportation, after listening to the community's concerns and objections, proposed an alternative plan that would eliminate the need for a flyover structure. The plan that was eventually agreed upon, proposes constructing a dedicated Left Lane 2nd Avenue Exit to improve traffic flow coming off of Harlem River Drive. The plan will also include barriers between the sidewalk and road to protect pedestrians from high speed traffic flow coming from Harlem River Drive. While this alternative plan eliminates the need for a flyover structure, one of the HRPTF's biggest concerns, it still impedes on 12 feet of land dedicated to the future Southern Phase of Harlem River Park. Construction of this plan is underway and is expected to finish in 2017.